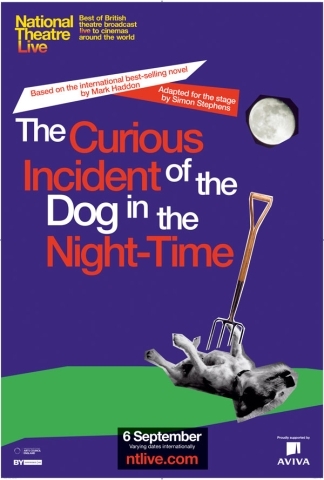 Simon Stephens’s adaptation of Mark Haddon’s much-loved bestseller is nigh on perfect. Translating what is largely an ‘internal’ book to the stage, the production is deceptively simple. There is no set to speak of. Actors bring on and take off nondescript white boxes to serve as tables, chairs, seats on a train, a walk down an escalator… Lighting defines sharp squares and oblongs for different rooms, different houses. Performed in the round, the design for this show is all about the floor. Marked up with a grid (that reminded me of Star Trek’s holodeck!) the stage is riddled with LEDs that both lead and trail the protagonist on his journey. Projections help to convey the impression of a tube station, a train ride and so on. It is all both complex and economical. But of course it is the actors who are the keys to open up this story of a teenager on the Asberger’s syndrome trying to solve the mystery of who murdered his neighbour’s dog with a garden fork. As 15 year old Christopher, Luke Treadaway is both magnetic and a little disturbing. This is no white-washed sentimental portrayal. We understand his parents’ frustrations and admire his mentor’s patience, all the while caring for this boy. His direct and literal approach to life amuses; his violent rejection of physical contact touches us. It is a remarkable portrayal. As mentor Siobhan, Niamh Cusack also doubles as a narrator. It is revealed as the action unfolds that we are watching a dramatisation – the whole play is a play-within-a-play, cranking up the cleverness level. Along the way we meet a host of characters, walk-ons and cameos, and it is particularly delightful to see Una Stubbs, bright-eyed as ever, as elderly neighbour Mrs Alexander. Marianne Elliott’s direction keeps a complex set-up clear, working the cast like cogs in a super-efficient machine. Movement sequences are particularly effective, stylised in such a way to be evocative and supportive of the narrative. Now, some people are rather snobbish about the whole enterprise of live broadcasts to cinema screens. Everyone should go to London and see the shows live, they say. Well, I’m sure everyone would if they could (as if the scramble for National Theatre tickets isn’t bad enough already). But for occasions when that is not possible, a trip to the local cinema is a more-than-adequate substitute. With this particular production it could be argued that the cinema audience actually gains something – as well as affording us close-ups of the actors, we also get bird’s-eye views of the stage, making the projections and floor work perfectly clear. What you lose on the swings of being present for the live experience, you gain on the roundabouts of multi-angle cameras. This most famous play by Irish writer J.M. Synge gets a high quality revival at Kevin Spacey’s Old Vic. With an impressive, rotating set – almost a full-sized crofter’s house – and attention to detail, the community of gossips in County Mayo at the turn of the 20th Century are brought to life in such a way the relevance of their behaviour to the modern world is allowed to come to the fore. One might think Mr Synge was prescient. A young man stumbles into this house – it is a public house- looking the worse for wear after walking for eleven days. The locals, keen for entertainment, speculate on what might have spurred him to make such a journey. It comes out that the young man is named Christy Mahon and has murdered his own father with a shovel. Mahon is awarded instant celebrity status within the community. Each time he recounts the story of the murder, details are added and embellished. As the story grows, so does his confidence and self-esteem, buoyed up as he is by this new-found adulation. The local girls fawn over him. The men respect him and barmaid Pegeen and the Widow Quinn vie with each other for his attentions and hand in marriage. This state of bliss and popularity is short-lived: the supposedly dead father rocks up at the pub, his head in a bandage. The Widow Quinn, always with her eye on the prize (played with a Machiavellian twinkle in her eye by Niamh Cusack) tries to get rid of him. From this point the action relies heavily on dramatic irony. The audience knows without a shadow of a doubt that young Mahon is a fraud. The thing is we don’t mind in the least. He has become a charismatic and charming fellow whose declarations of love for the barmaid are touching and lyrical. Inevitably, the all-too-alive dad comes back and Christy’s story is exposed as the lie it always was – just at the point where he is being feted for having won all the prizes in the local sports day. The locals turn on him in an instant. With his new life destroyed, Christy flies into a rage, chases his dad from the pub and administers a second, supposedly fatal blow. No one can accuse him of lying now, but still the locals aren’t appeased. Telling a story is one thing but actually committing the crime before their very eyes is beyond the pale. They decide to arrest Christy and drag him off to the “peelers” and an inevitable hanging. And then the dad, his head shining with fresh blood, comes crawling in. Christy is doomed to return to his life before, but there is a change. He will no longer be the victim of his dad’s bullying and abuse. The tables have turned forever. The Mahons leave, their roles reversed, and this affable young man has become the monster from whom he was trying to escape. Pegeen the barmaid sinks to the floor, realising she had been caught up in the glamour and the gossip but nevertheless has lost out in love, the love of a man who didn’t really exist. As Christy Mahon, Robert Sheehan (him off of Misfits) makes his professional stage debut and portrays the quivering, gangling youth who transforms into a likable braggart with just the right amount of mugging and gurning, tempered with vulnerability and charm. Ruth Negga’s Pegeen is stunningly beautiful and speaks with fire in her eyes and her belly. The whole ensemble, in fact, helps to create a sense of the wider community – a microcosm of today’s celebrity culture: we build ‘em up and knock ‘em down. Some are complicit in their own rise and fall, their pursuit of the bubble reputation. Director John Crowley keeps the atmosphere light – until the third act but even here the humour is still present, albeit much darker in tone. I had some issues right at the outset with the opening duologue between Pegeen and her suitor Shawn – it took a few minutes for my ears to attune to the accents and the brogue, but then this can happen when watching Shakespeare too. That aside, I enjoyed the play very much, glad that I was able at last to see why it deserves its reputation as a classic, a reputation founded on fact rather than gossip.